​With the option of a 6 man canteen and 4 man office, it gives you or your clients maximum flexibility. 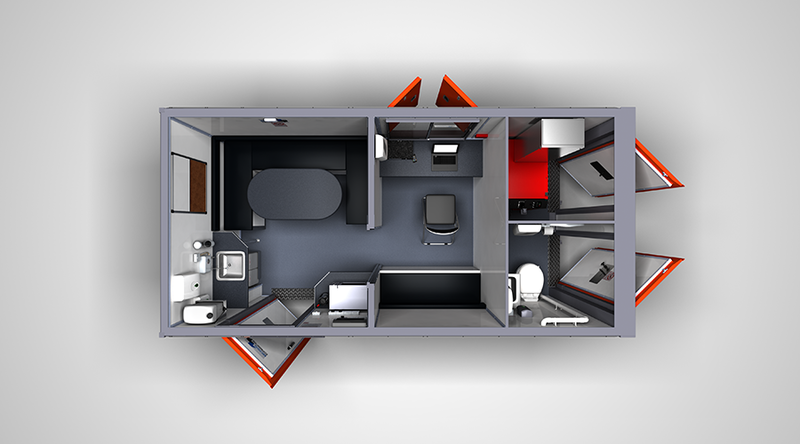 ​Design is at the core of our large-capacity road towable welfare unit. The twin axle design makes it easy to transport and meets all of the HSE welfare on-site standards Power is provided by the integrated silenced 7KVA diesel generator which supplies two electrical specifications, Eco+ and Hybrid. Bench seating to accommodate six or twelve people with dedicated storage inside, table, 2kw ceiling mounted heater, microwave, forearm sink with hotwash, towel and soap dispensers, window with security shutter. Recirculating chemical toilet, sink with hotwash, high-security skylight, PIR LED light. Generator / Drying Room, Diesel generator, tubular heater, coat hooks. Desk space for four people with storage shelves under, four double sockets, four office chairs. Meet different site requirements and those of the HSE. Defined canteen, rest area, office and storage sections. Free ‘Chip Guard’ coating to all cabins prior to painting. Free bespoke paint finish on all orders. Free ‘Ram Guards’ supplied with all cabins, to allow safe working practices when in the field. Annual Safety Inspection – Designed to ensure the safe operation of all makes of mobile welfare cabins, making sure you stay safe and within the law.